The thing about a rebuild is if you don't work on it at least once a week you can forget where everything goes. I thought they said 50 was the new 30? Cheers Mate! I'm loving this project. 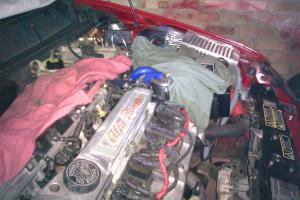 Just want to get it done and take it out on the race track!!!!!! I think I'm going to have to work night shifts to get it done. 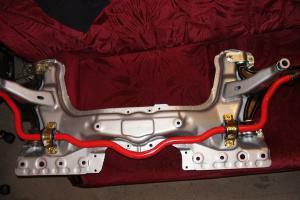 Got the front subframe ready. For anyone thinking of doing this don't bother bolting the wishbones on as I had to take them off when bolting the frame to the car. I know i'm sad but did you paimt the wish bones + were all the rubber sits into ? No probs. 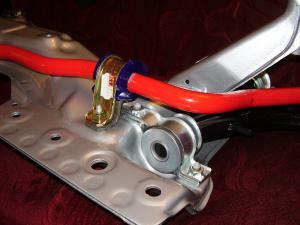 The offside wishbone with the red ball joint cover is a brand new item and it has the original black paint work. 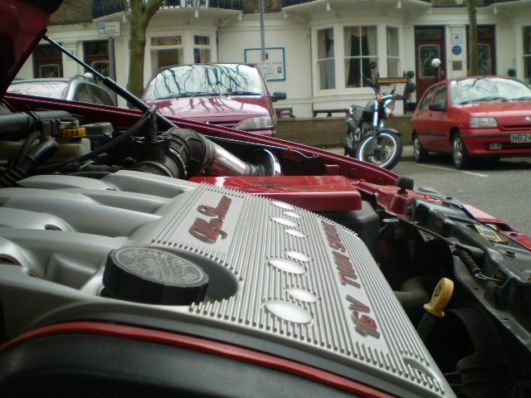 The nearside one, which was virtually new, i did clean and paint up with a dash of black hammerite. I decided not to poly bush the wishbones as they were brand new. 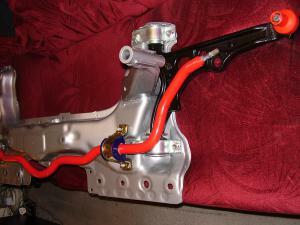 The wishbones are quite easy to take off the subframe anyway should I decide to do this at a later date. I had to drop the front subframe twice now once to get the gearbox shifter housing brackets on and secondly to locate the steering rack to line up the bolt holes. 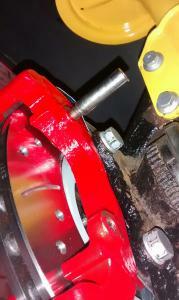 The steering rack was impossible to bolt on with the subframe bolted in place so I had to drop the subframe a bit. 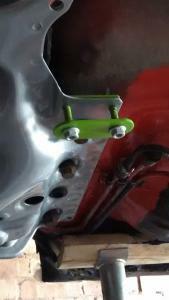 BTW you can't get the lower arb bracket anymore only the upper clamps. Luckily I kept my originals and cleaned them up. Fiat Coupe arb lower clamps will fit but the depression is too low and you won't be able to tighten the upper clamp enough to tighly hold the arb in. Easy to replace. Take the exhaust off and the you can drop the gearshift housing off and the whole gear linkage. 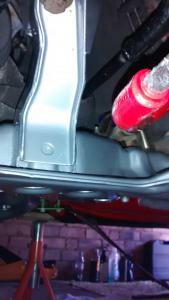 Undo the nuts holding the gearshift housing. Today I had put the arb drop links on the wrong way round - I assume the drop links are slightly angled towards the middle of the car. Arb nut and drop link nut seem to seem to tighten forever. 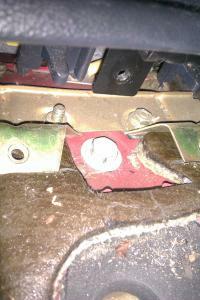 Can't get a socket in the tight space so going on old pics and counting the number of exposed threads. Some more pics from this week. 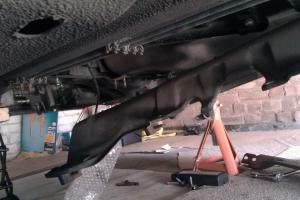 Also, the steering rack bolts could only be lined up with me dropping the sub-frame again.. 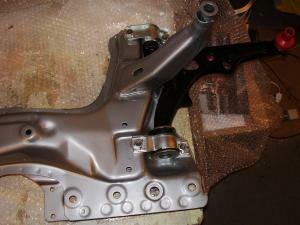 I noticed the FIAT/Lancia stampings on the the subframe. Had to take the air intake off to get clearance for the new brake lines. Also, I fabricated a shield to protect the pulleys from stones and whatnot. The arb droplinks have to have no more than 5 thread teeth showing (the 6th one being just inside the nut) or else they'll be over tightened. 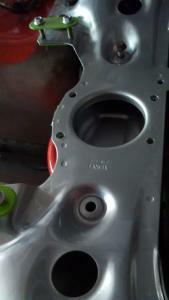 If you go with the torque setting you'll just squash the rubber or polybushes. The arb end nut also cannot be too tight. 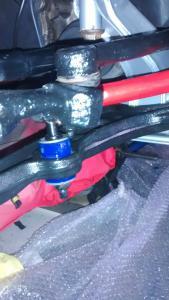 Again, if you use a torque wrench on the arb end nut it will be over tightened and the anti roll bar won't move freely. 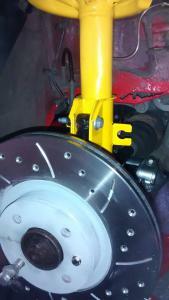 Going to powder coat the strut brace yellow this week to go with the yellow suspension struts. Bolted on the strut bolts on far side front disc. Realised I'd got the slots pointing the wrong way - I know it doesn't really matter which way they point and that the important thing is the direction of the vanes in the vented disc. My Mitec disc being neutral it doesn't really matter which way the slots are pointing. 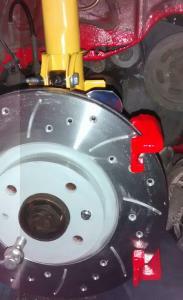 However...Brembo suggest having the slots pointing towards the caliper. 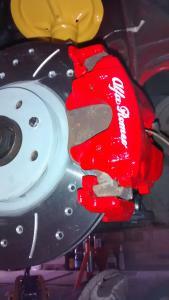 So, without further ado, I thought, if it's good enuff for Brembo it's good enuff for me. After all, who am I to argue against Brembo. 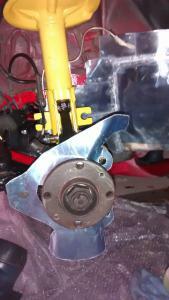 Disc/rotors pointing the way they were intended to be with attached caliper bracket. Everything was a bit tight and had to copper slip all the bolts. The vanes on the ventilated disc don't point in any direction. Just air vents for cooling. Finally got these babies on. I put on around 3 coats of brake paint on. Very happy with the resultos. 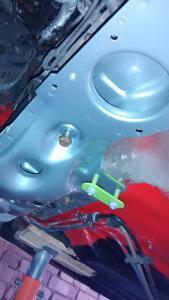 "..head's up don't coating the adjust stud/nut. If your's has one as when you come to refitting it be comes a pig of a job"
I've not powder coated anything else. But what is the adjust stud/nut? Know what you mean about knocks on the car. That's why I've done all the detailing under the car. They can't see it or touch it but I know its there. Oh I see, its the strut brace. I've got a OMP With the triangular end sections. Was looking more into drilled and slotted discs. 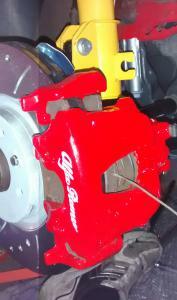 Read that if the slots face away from the caliper its suppose to aid cooling and gets rid of debris. 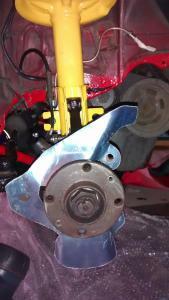 If the slots point toward the caliper its suppose to be more aggressive but encourages wear.  Something you may want to consider. Decided to get new pads as mine were unevenly worn so chance to deliberate whether I put them back. Mtec paperwork, which I found today has them pointing away. 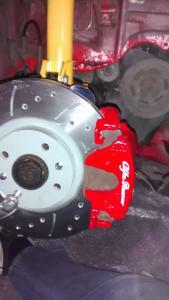 Only Brembo has them pointing forward. What pads have you got? 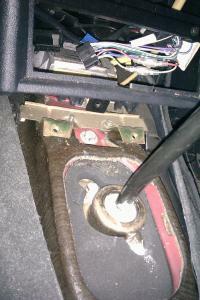 did you put back the bolt back that holds the gear stick tunnel under the front of the radio/dash i think thats why mine snapped off ! Not yet. I haven't got that far yet. Only just done the farside brake gear. 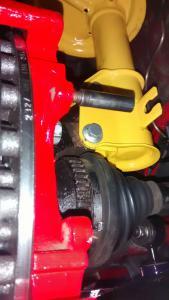 That bolt that you're talking about was the bloody thing that kept me from dropping the gear stick tunnel. I couldn't figure out why it wasn't dropping and then.. I spotted it That was way back last year though.